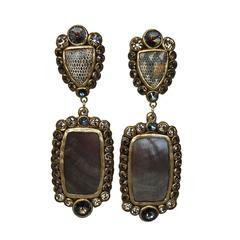 Grey mother of pearl clip earrings with crystal and paper mache detailing from Ella K Jewelry. 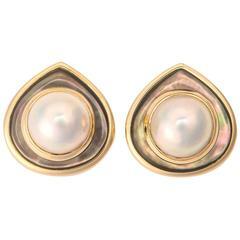 The collet set central mother-of-pearl to a border of pearls. Mounted in yellow gold. This gorgeous Tiffany & Co. design is perfect for a jewelry aficionado. 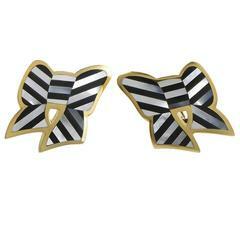 The earrings are made of 18K yellow gold bows and feature a gorgeous inlay of mother of pearl and black onyx. A classic hard to find Angela Cummings design. This soft tear drop shape is a perfect flattering fit. 7/8's of an inch in size. 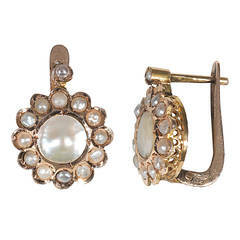 A fabulous pair of Hermes earrings featuring inlaid mother of pearl within a link motif in 18k yellow gold. 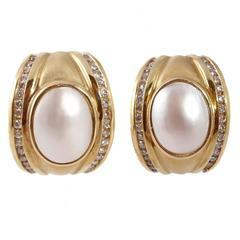 Pierced and clip, snug and comfy, featuring mother-of-pearl centers, with rows of diamonds!